Experience the skin-perfecting properties of Manuka Doctor's ApiRefine Illusionist Rapid Lift Mask, an award-winning face mask that works to visibly reduce the appearance of wrinkles. 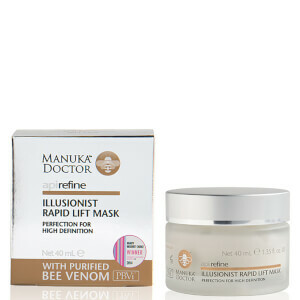 Clinically proven to diminish the look of wrinkles in just ten minutes, the anti-ageing mask utilises Purified Bee Venom (PBV™) and Chicory Root to perform a tightening effect on skin, whilst Shea Butter and Manuka Honey intensely soften and hydrate to promote a radiant, smoother-looking complexion. Skin feels plumper, firmer and is protected against free radicals with antioxidant Vitamin E.
Expect illuminated, supple and younger-looking skin.